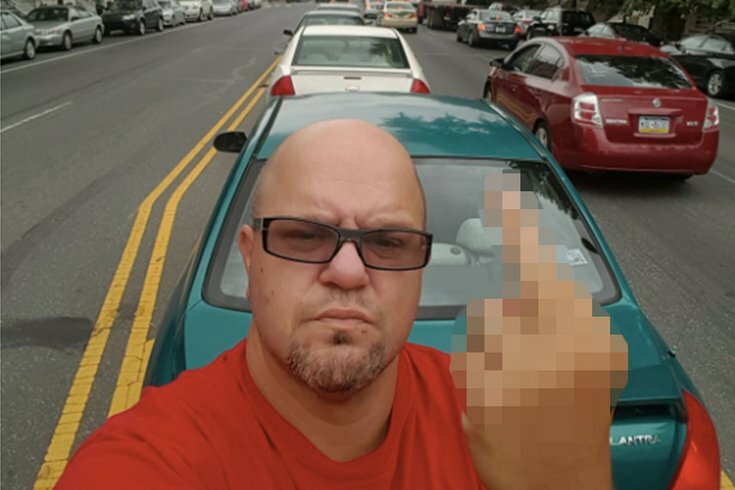 Marc Ferguson, 45, a lifelong resident of South Philadelphia, supports the long tradition of parking on the median of South Broad Street. An intensifying battle over Philadelphia's stance on median parking along South Broad Street, an illegal but unenforced practice for the better part of a century, took another turn this past week with the launch of a petition to overturn the city's nominal ban. Marc Ferguson, a lifelong resident of South Philadelphia and a leading advocate for median parking, has already collected more than 830 signatures on Change.org. He's not stopping there. "This law was implemented in 1917," Ferguson told PhillyVoice. "It's way out-of-date." The push comes just as 5th Square, a local urbanist political action committee (PAC), sued the Philadelphia Police Department and the Philadelphia Parking Authority to compel them to enforce the law. Ferguson disagrees vehemently with 5th Square co-founder Jake Liefer, whose PAC made the call to sue after getting stonewalled on median parking for the past year. 5th Square's own petition to enforce the law, circulated after last year's temporary ban during the Democratic National Convention in July 2016, failed to convince the city to take permanent action. "He's strong on his views. I'm strong on mine," Ferguson told PhillyVoice. "I do support some of the stuff that 5th Square does. They do a lot of due diligence in the city. Hopefully, it can get rectified shortly." 5th Square and other opponents of median parking, tacitly allowed on the stretch of South Broad Street from Washington Avenue to Shunk Street, cite a number of safety concerns as the primary reason the existing law should be enforced. Liefer references PennDOT crash statistics showing that every pedestrian fatality on South Broad between 2008 and 2016 occurred below Washington Avenue, where about 200 cars pack the median strip at any given time. Obstructed buffer zones, crosswalks and turning lanes put pedestrians in peril, 5th Square argues, and the city has shown no willingness to implement feasible remedies such as safety posts, speed cushions and intersection daylighting. But Ferguson, who serves as an administrator for Taking Our South Philadelphia Streets Back, says 5th Square's concerns are overblown and unproven. "The claims set forth by 5th Square are that there's fatalities and accidents in relation to median parking," Ferguson said. "The city has told them that there are no records that they can find directly relating an accident to median parking. Those claims coming from 5th Square are exaggerated." South Philadelphia is a notoriously difficult place to find parking, especially on and around Broad Street. Ferguson deals with the issue on a regular basis in ways he says go beyond routine frustration. "I am a dialysis patient and occasionally have to use the median when I get treatment on South Broad Street," Ferguson said. "The median parking is in the middle of two permit parking zones, but since I don't live in those zones, I'd have to resort to the two-hour parking zones, which don't leave me enough time. I use the median parking because it's free and there are no time restraints." Ferguson, 45, said many business owners along South Broad Street also believe median parking is an important resource for the community. 1. Vehicles will not park in turning lanes or crosswalks, nor on existing angled yellow lines that the city has identified for visibility. 2. Vehicles will not park on existing concrete medians or subway grates. 3. Vehicles must park between the double yellow lines with no portion of the vehicle obstructing traffic. "We do think that people should have some rules enforced," Ferguson said. "Philly has been enforcing ticketing and towing in these areas, and we agree with that. We don't want accidents. We don't want people getting hurt. But you can't eliminate 200 parking spots in an already congested spot without an alternative resolution." Median parking originally became entrenched on South Broad Street because it was a solution to the glut of cars waiting to process from the thoroughfare's many funeral parlors, Ferguson recalled. "That was in the Forties and Fifties," Ferguson said, and parking hasn't gotten any better since then. "If the city wants to put meters or four-hour parking there, we're for that, too," Ferguson said. "It's just that getting rid of median parking is detrimental to the people and businesses in that area." Ferguson and his partners have already been in touch with City Councilman Mark Squilla, who represents Philadelphia's 1st District on Broad Street's eastern border, and state Rep. Maria Donatucci to build support for legalizing median parking. The state legislature's involvement is required because Broad Street is a state highway. City Councilman Kenyatta Johnson, who represents the city's 2nd District, had not yet responded to the petitioners. "We just want to set up a meeting," Ferguson said. "They're waiting to see what the city is going to do with 5th Square's lawsuit before they make a move."